I love all types of onion rings…crispy, crunchy, thick, thin, or anything in between. Recently, I was planning to prepare fish & chips and decided to trade out the ‘chips’ for onion rings. Having the batter ready for the fish, made this conversion super easy. Out side of home, most onion rings that I’ve had were made with sweet onions. 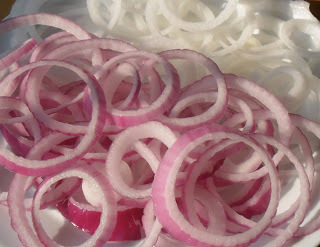 I find them too mild and opted to use both red and white onions for this recipe. Add seasoning to remaining flour, then whisk in beer. 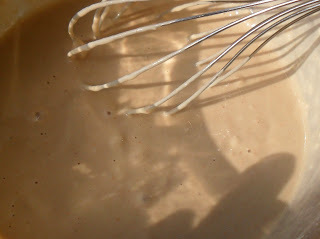 Looks almost like pancake batter…time to dip and fry! 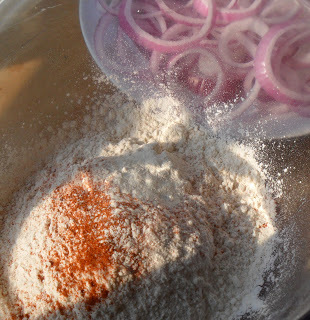 In a shallow dish, dust sliced onions with 1/2 cup flour and set aside until ready to use. In a large bowl, combine remaining flour(1 1/2 cups), salt, onion powder, and paprika. Whisk in beer and stir until smooth. Heat oil in a heavy skillet on medium-high heat until it sizzles if a drop of water is added, 350 degrees. Remove onions from flour and add to beer batter, turning to coat rings. Shaking the excess batter from each ring, add rings individually to the hot oil. Allow to fry for 2 minutes or until golden brown, turning once. 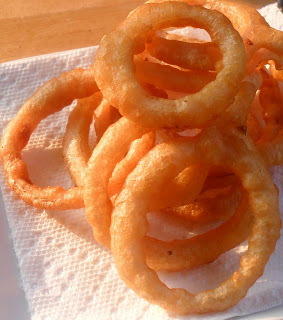 Transfer fried onion rings to a paper towel lined platter. Repeat frying process with remaining onion rings until finished. Oh wow I am weak for onion rings, so yummy. I wanted to invite you to enter my current give aways, there are a few going on this week, here is one. I also wanted to invite you to a fun new anything goes link party I am starting this Friday through Sunday. Hope to see you show off these terrific onion rigns and more! If you want to grab the button for the PMS Party Mindie Style it is on my blog now. These look wayyyy better than anything you could ever get at a restaurant. They look so golden and crispy and yum! 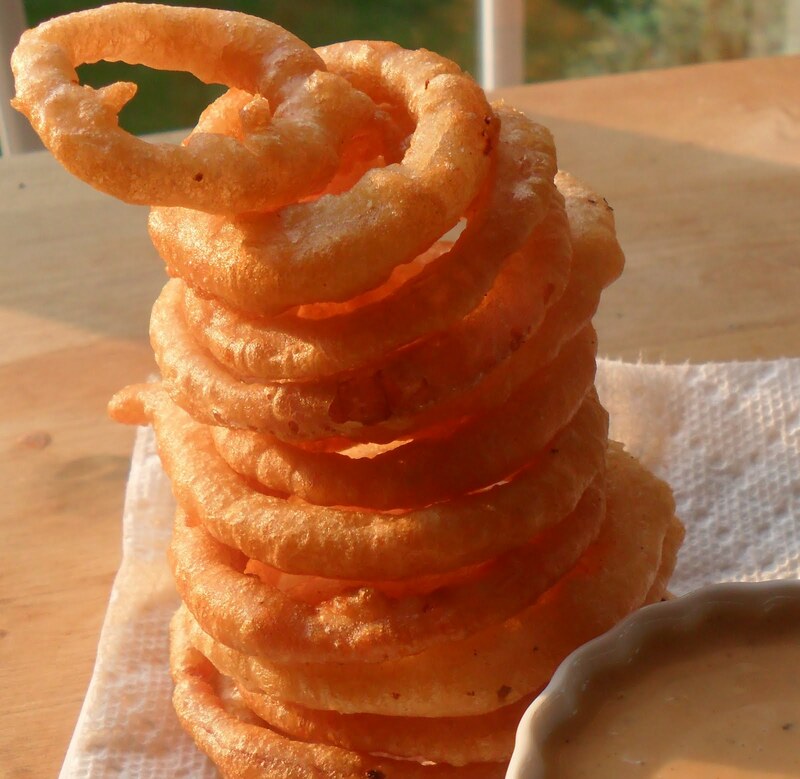 These look so yummy, I LOVE onion rings, I have to try these and soon! I just wanted to reach out a grab one! Love it! Shawn, this is amazing. IThe onion rings are so perfectly deep fried! I love the towers – they look like flawless!! I love adding beer as an ingredients – it sounds cool and I’m sure it tastes so good!!! @Mindie…Thanks, I really need to learn some of your networking skills! @Celeste…Thanks, they are super easy and super good! @Served up with Love…You’re gonna love them! @Nami…Thanks, the batter is very light…It seemed to brown better than my egg/beer batter. Perfect! Just used it for frying fish, it turned out beautifully gold and crispy! Thanks!